This article is about the coins used in Coin Battles. For other types of coin used or shown in the Super Smash Bros. series, see Coin (disambiguation). Smash Coins and Bills, as seen in Super Smash Bros. Brawl. Smash Coins and Bills (sometimes simply called Coins and Bills) are items that only appear in Coin Battle matches. Each coin has the Super Smash Bros. logo on it. Coins can be found in container items but are much more commonly produced by attacking opponents; the amount of money generated by a hit is roughly based on its damage and knockback. Coins will bounce a short distance when produced and can be picked up by touching them. Being hit by opponents does not cause one to lose coins (new coins are produced instead), but being KO'd will cause the player to lose half their coins (up to a maximum of 100 in Brawl). If the player is KO'd off the side (as opposed to the top or bottom), the lost coinage will be tossed onto the stage. In Melee, there were gold, silver, and copper/bronze smash coins, worth ten, five, and one point respectively. In Brawl, the coins were lowered in value to six, three, and one point respectively, but a new item, the Smash Bill, was introduced. Bills flutter and fly erratically, making them difficult to pick up, but they are worth 10 points each. 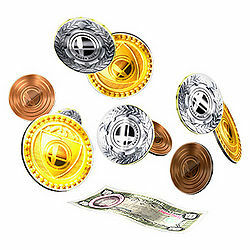 These coins are used in Super Smash Bros. Melee Coin Battle mode. The gold coins are worth ten points, silver are worth five, and the copper are worth one. Hit an opponent and coins will come raining down. If you're knocked off the screen, you'll lose half of your coins. Once time's up, the player with the most coins wins. Items that appear each time you smack an opponent in a Coin Battle. The person who has the most coins when the game ends is the winner. There are gold, silver, and bronze coins, which are worth six, three, and one point respectively. Attacks that cause the most damage also produce the most valuable coins. You don't lose coins when you take damage. Coin battles see which player can collect the most coins. Beating up your opponents will send coins flying, and then you must collect them! There are three types of coins: Gold (6 points), Silver (3 points), and Bronze (1 point). Deal more damage to your opponent to make the more valuable coins fly free. Coin matches are all about making your opponents drop coins by attacking them, then seeing who's collected the most at the end. The coins come in bronze, silver and gold varieties, worth 1, 3 and 6 points respectively. The harder you hit a foe, the better the coins they'll drop - so get smashing to cash in! Smash Coins as they appeared in Melee. Smash Coins trophy in Melee. Smash Coins trophy in Brawl. Smash Coins trophy in for Wii U. A close up of a bill in Super Smash Bros. for Wii U. A challenge image of Mario and Luigi in Smash for Wii U. The Super Smash Bros. for Wii U bill design includes the abbreviation "SMBR", which uses the first letter of each romanized mora in スマブラ (Sumabura), the Japanese abbreviation of Smash Bros. It also features a picture of Nintendo's Kyoto headquarters and a stylized slogan "Love&Peace". On the left side appears to be a man (possibly Sakurai), wearing a hat akin to Mario's or Luigi's. This page was last edited on December 26, 2018, at 03:19.